Hotel Taj Hari Mahal Jodhpur, Taj Hari Mahal Hotel Jodhpur, Reservation for Hotel Taj Hari Mahal, Jodhpur, India. 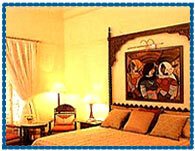 Address: 5, Residency Road Jodhpur, Rajasthan, India. Hotel Taj Hari Mahal is situated in the Blue City of Jodhpur, spread over 6 acres of lush landscaped gardens, on the edge of the vast Thar desert. 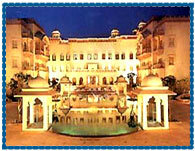 The building of hotel is made of Pink & Red sand stone in Marwari style architecture. Hotel offers a magnificent oasis of skillfull design, traditional glory with elegance and luxurious refinement of the modern day. Hotel offers 93 well appointed rooms and suites viewing to the bustling city or the shimmering blue pool. All the rooms have a fine touch of the grandeur of an earlier era providing all the modern amenities including modems and data ports. Banquet, Restaurant, Business Center, Laptop, Pagers, Cellular Phones, Computers on Hire, Library, Multimedia Computers, Secretarial Services, Workstations, Fax/Telex/ Email, Babysitting, Beauty Parlour / Hair Salon, Car Hire Service, Currency Exchange, Doctor on Call, 24-hour Room Service, Express Laundry / Dry Cleaning, Travel Assistance.